Fatty fish are Nature’s richest sources of the beneficial long-chain omega-3 fatty acids EPA (eicosapentaenoic acid) and DHA (docosahexaenoic acid). GNLD’s pure and potent Omega-3 Salmon Oil can boost the omega-3 content of the diet and support a beneficial balance of fatty acids. While three capsules provide the omega-3 value of half a serving of fresh salmon per week. Why fish oil rich in Omega-3 fatty acids? Fatty fish is the richest source of beneficial omega-3 fatty acids, but most of us do not eat the two to three servings per week that experts recommend for optimal well-being. Omega-3 fatty acids support optimal function of body tissues and organs. Omega-3 fatty acids, crucial to the development of the infant brain and eyes, are naturally present in mother’s milk. Infants whose mothers consume foods rich in omega-3 fatty acids have higher omega-3 fatty acid levels compared to those whose mothers do not consume omega-3-rich foods. People who do not like fish can get the omega-3 fatty acids they need for optimal well-being from supplements. 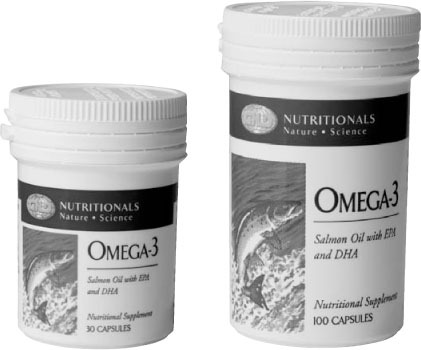 Why GNLD Omega-3 salmon oil? Contains pure salmon oil. Does not contain undesirable oils from shellfish, shark, other scavengers, bottom feeders, or sea mammals. Derived from healthy, fresh salmon from pristine waters. Salmon are fished from deep North Atlantic waters, health-screened to certify that they are free of disease and selected for human consumption. Only “body oils” used. Selecting oils from only the edible portion of the salmon reduces exposure to substances which may collect in organs (herbicides, pesticides, heavy metals). Potency guaranteed two years after manufacture. Three capsules provide concentrated omega-3 fatty acids - a minimum of 165 mg EPA (eicosapentaenoic acid) and 135 mg DHA (docosahexaenoic acid). Balanced ratios of EPA and DHA as found in nature. Pure salmon oil. No oils from shellfish, scavengers, bottom feeders, or sea mammals. Health-screened. Fish are certified disease-free and selected for human consumption. “Body oils” only. Oils is pressed from flesh, not organs where toxins may collect. Potent. Three capsules provide 165 mg EPA and 135 mg DHA. The omega-3 fatty acid value of half a serving of fresh salmon in three capsules. Extremely low in cholesterol (1 mg per capsule). Low-kilojoule. Only 21 kilojoules per capsule. Soft gelatin capsules are easy to swallow.